ADD illustrated pretty much perfectly. I’m ADD, but didn’t know about it until my 30’s. Every now and then someone will ask me what it’s like and I usually say that it’s like having a television remote control with a stuck channel changer button. That’s not a great analogy. 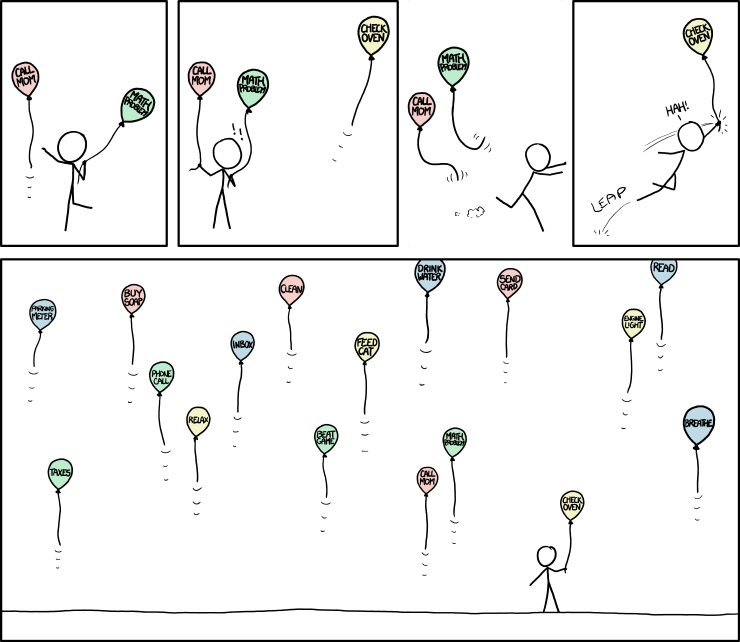 Via the always great XKCD. Was surfing around the website for ADDitude magazine and came across this page that listed 50 (or so) Great Things about ADD. I laughed out loud at least three times at things that were so definitely me. Somedays the ADHD comes shining through. Can’t do that anymore because I have a family now. I’m not just affecting myself when I get impulsive and reminding myself of that usually keeps me in check. Recently I mentioned on here that Neverwinter Nights has gone gold. This game has been in development for over five years and I’ve been following it pretty closely the whole time. It’s easy to say that I’ve not been this excited about a particular video game in a long, long time. It’s supposed to hit store shelves sometime next week, but there was a rumor floating around yesterday that some Best Buy stores had gotten it in early. Oooooooooo! The thought of getting a game that I and my buddies have been waiting five years for before anyone else suddenly flooded my head. How much fun would I have annoying my buddy Bill who had pre-ordered his copy on-line and probably wouldn’t see it until the end of next week if I could call him up and tell him how I was sharpening up my vorpal sword for a session in NWN. More so than the pure joy harassing a good friend, though, was the overwhelming desire to play this game I’ve dreamed about for five years. I wanted this game, badly. Those of you who are not gamers are thinking to yourselves, “Sheesh, get a life buddy! It’s just a GAME!” To which all I can say is: Everyone has their passions that they do stupid things for. I stayed late at work and started calling stores. Best Buy in Dearborn, Best Buy in Westland, Best Buy in Novi, Best Buy in Ann Arbor. All the stores I could think of within a reasonable driving distance between work and home. Just this act of calling around raised my pulse and quickened my breath as my excitement continued to grow. The Novi store said they showed they had 18 of them in stock, but no one could locate where they were in the store. That was all I needed. I left work and started home heading straight to the Dearborn BB to stop and check it out. Half the clerks I spoke to had never even heard of the game so there was a chance they overlooked it on the display rack. I stopped at the Dearborn Best Buy, Dearborn CompUSA, Dearborn GameStop (which turned out to only sell console games), Stopped at the Westland Best Buy and the Westland Software Etc. All I could find was some promo boxes on display in the BB stores that you could take up front to pay $10 and pre-order the game. I finally concluded it was those boxes the Novi store was registering in their computer, not the actual game itself.